Montana’s Outdoor Legacy Foundation is proud to be the vehicle through which those who love Montana can support fish and wildlife conservation, outdoor education and access to the places and outdoor opportunities we all enjoy. The Mission of the Foundation is to leverage private funding to preserve the natural, cultural and recreational resources that make Montana – Montana. Montana’s Outdoor Legacy Foundation is the primary non-profit partner of Montana’s Fish, Wildlife and Parks Department. By working collaboratively with the state agency responsible for the management of Montana’s fish and wildlife resources and Montana’s state parks, we are assured that the projects we support are scientifically sound and that they represent the highest priority conservation opportunities in the state. The Foundation is also the Manager of the Montana Fish and Wildlife Conservation Trust which provides funding to support recreational access across the state. As Trust Manager, this trust has increased from its original $14.9m to roughly $25m and provides about $1m annually to high priority access sites in Montana. Montana is more a state of mind than a state. Montana is loved by its residents and adored by its visitors because it is Montana. Montana’s vast and vibrant fish and wildlife populations, beautiful plant life and breathtaking viewscapes are as good as they are because they exist in Montana. When residents say “welcome to Montana,” we are not welcoming someone to an area of geography, we are welcoming someone to a way of life. 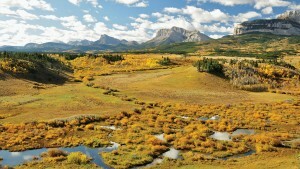 Even a short drive through Montana reveals that Montana is a “working landscape.” Nested within extensive mountain ranges, vast expanses of prairie grasslands and sage habitats are working ranches, farmlands and communities where people work the land, preserve the habitats and enjoy the natural resources that make Montana – Montana. The legacy of the Foundation will be ensuring that Montana remains Montana for the generations that follow. Join us in ensuring the Montana outdoor legacy continues!